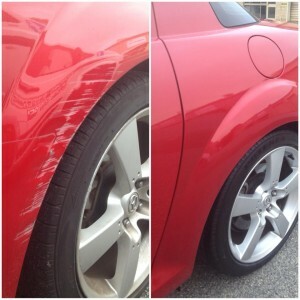 Typical wheel arch repair before and after. Lease car repairs in Perth. Whether you’re responsible for an entire fleet of cars or just a single leased vehicle, Smart Finish can help you save money on cosmetic repairs when your lease is due. Don’t be the victim of exorbitant charge backs! Give us a call before you return your vehicle. In most cases, when you return your lease vehicle, your lease company will inspect the vehicle, including any cosmetic damage such as paint scratches, dents, dings and wheel damage. This inspection can occur at the time of vehicle pickup, but often occurs a day or two later when the lease company spends time conducting an in-depth, hour-long inspection of each vehicle. Any damage they find must be repaired at your expense and in most cases you will be “charged back” for the repairs… at full price dealership repair prices or panel shop prices. This can cost you a bomb! We have helped a number of Perth businesses save money by using relatively inexpensive SMART Repair techniques for lease cars to repair cosmetic vehicle damage before the cars are returned. In most cases, the leasing company does not even notice the repairs upon inspection – it’s like there was never any damage. What’s more, because we’re mobile and we use techniques that keep repairs small, our prices are just a fraction of panel shop prices. We really can save you a fortune! Whether you have a large fleet or just a few company cars, we can help. All kinds of minor cosmetic vehicle damage can be repaired on site and in a single day. If you have a lot of vehicles, we can arrange to spend a few days on your premises to restore all your lease vehicles to pristine condition. We can repair one vehicle at a time or more at your request. Call us today to discuss.